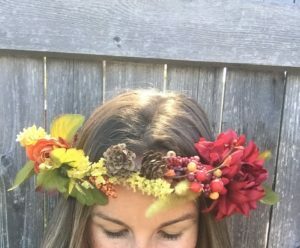 Turn your autumn wildflower scavenge (or... trip to the craft store) into a bohemian crown! These are much easier to make than they look and 0h-so fun to wear. Get craftin'! 1. 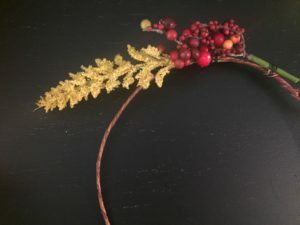 Use the coated wire to make the crown by wrapping it around your head. Measure two more inches than the circumference of your head. Cut. 2. 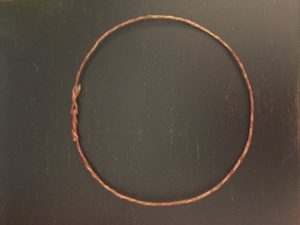 Make loops on the ends of the wire and hook the crown together to create the circle. 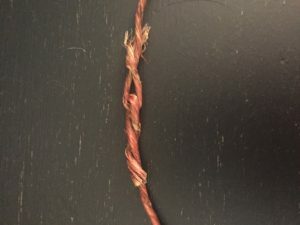 Twist ends of wire to secure. 3. 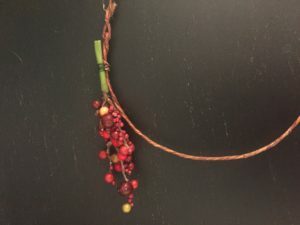 Trim the first flower (or twig or pinecone) to desired length and position so that the stem end is toward the loops (this will be the back of the crown). Make sure your favorite and most beautiful part is pointing forward. Connect the flower to the crown by wrapping the green paddle wire around the stem. 4. Trim your next piece and position so that the stem is pointing towards the loops again. Here, you can overlap the pieces or spread them out, whichever you prefer. Pro tip: Overlap pieces and use the green paddle wire to secure the stem as well as to tame down the last flower if it's sticking out too much or lookin' a little less than perfect. 5. Continue adding nature and wrapping with wire until you get to the middle of the crown, directly across from the loops. Remember to switch the direction in which your pieces point as you get to the other side of the crown so that the stems always point back and the buds or blossoms point towards the front.